The best way for a celeb with a nascent fashion line to show off his or her clothes is while making the promo rounds for a film. Melissa McCarthy wore a dress from her Melissa McCarthy Seven7 clothing line, which lands in August, that featured a cream and red print. The brand's official bow is still two (agonizing) months away, but the always hilarious McCarthy introduced a frock by wearing it at the NYC premiere of Spy, the upcoming action comedy of which she is the lead star. 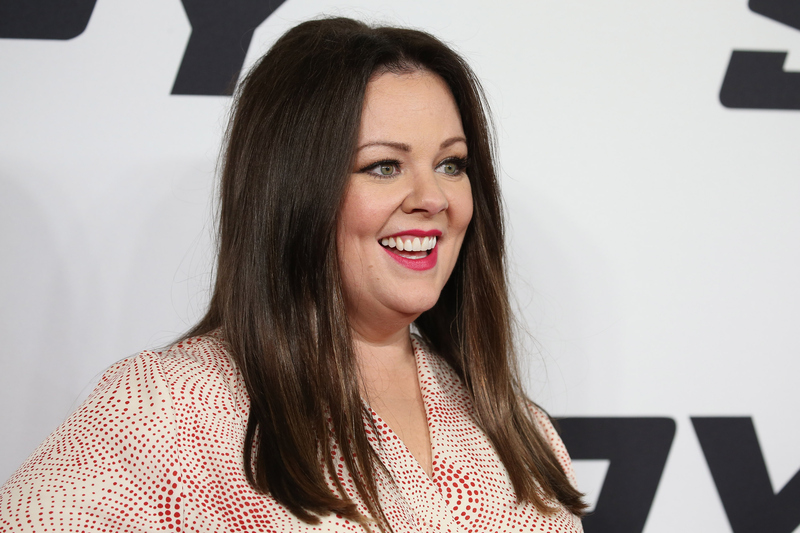 Let's not mince words here — Melissa McCarthy is a boss, both onscreen and on red carpets. It would be ridiculous for the actress, 44, not to show off her designs and pieces while smack dab in the middle of a high-profile press tour for a summer film and she looked so freaking stunning while doing so. "I just don’t believe in a uniform," McCarthy told PEOPLE. "I think if people have it and they love it, great, but I think people get into a rut and I’ve always been someone who gets a kick out of dressing." McCarthy clearly likes fashion and enjoys putting together ensembles or else she put wouldn't be rolling up her sleeves and diving into this category and crafting outfits that are chic and flattering. She also told PEOPLE, "I want women to get dressed every day and feel good about themselves. I don’t care what it is, if it’s dyeing your hair blue, if it’s a sweater, whatever you want to do, if it makes you feel good and empowered, I stand behind it 100 percent. And if I can be a little tiny block on that wall, I’d be proud of that." You can peruse all the details about Melissa McCarthy Seven7 but how about we peep the dress from all angles and IRL? The long-sleeved, floor-skimming dress had an ethereal flow and made a majorly glam statement. The cream base and the red print mesh beautifully. I love how McCarthy paired hers with a crimson clutch. She also matched her lipstick to the dress. You can see the burst x dot print a little better here. Gorgeous, right? I love it. McCarthy looked gorgeous and she knew it. The sleek blowout was another nice touch, but the dress was made for her and by her. How about that for flawless? Also, don't miss the pearl buckle embellishment. What a nice, not-so-obvious touch. I seriously cannot wait to see the rest of the Melissa McCarthy Seven7 line, because with this dress, she appear to be onto something, making such wearable and glam pieces.